My five year old had hernia surgery yesterday so he now gets to spend the rest of the week recovering at home. While waiting for his surgery, he got the chance to watch a lot of PBS Kids cartoons on the hospital TV set. This morning my husband tuned into PBS with our outside antenna (since we don’t have cable TV) and my kids got to see more cartoons they never get to watch. In between TV shows, a lady comes on and talks about a variety of subjects with the help of props. This morning she happened to have a barn set on her desk. Here she is, holding the cow! If you’re wondering when the cow is, both my kids assured me the animal on the top left is one. Looking at it closely, I concurred. I don’t think the regular animal crackers bags have cows in them. Do you know? Growing up we only had the little animal cracker boxes, and I think those only had circus animals. 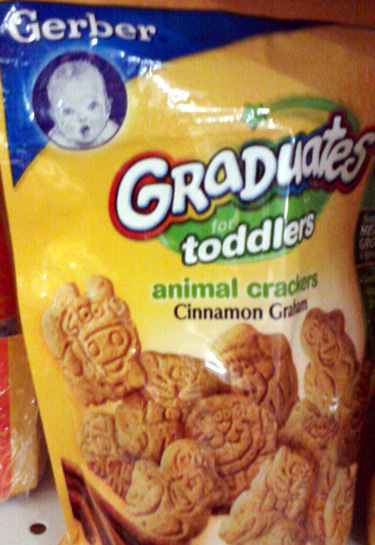 Yes, the circus animal crackers, that’s exactly what I was thinking about earlier. Best wishes on your son’s recovery! Thank you! He was bouncing off the walls today so I’m guessing he’s doing pretty well.